Another great graphic novel available in your local library. This gem reminds me a lot of To Kill A Mockingbird. 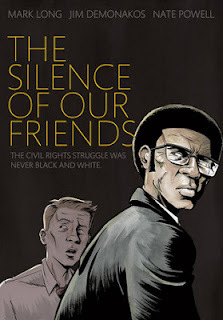 There are obvious reasons...a town that struggles with racism, a trial that brings the conflict of civil rights to the forefront, and the coming together of two families from different sides of the track. While Atticus Finch was a strong, proud, yet humble man, Jack Long is human. His heart is in the right place, and his actions speak louder than words, but he's still flawed, still struggling. The same with Larry Thompson. He is a man of anger and frustration, but remains a main of integrity with the ability to forgive. The front of the book says it best, "the civil rights struggle was never black and white." The language is real. The struggle is real. The heart is real. And the artwork is fantastic. Definitely a must-read.